A true Lamu landmark, Ras Firdaws sits in a breezy waterfront position just outside fashionable Shela with lovely views across the Lamu channel. An outstanding example of Moorish coastal architecture, it is also a charming and atmospheric 6-bedroom family home. Ras Firdaws House was built in traditional Moorish style by renowned safari guide and hunter Frank “Bunny” Allen, and for many years the house was owned by the Hooks, another prominent settler family. 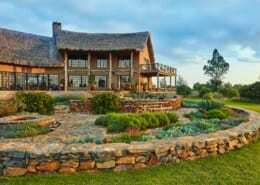 For the past 30 years the house has been a much-loved home-away-from-home for the same French family. 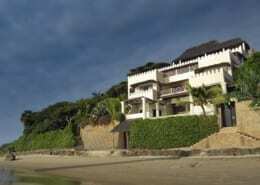 They have furnished Ras Firdaws with antique Swahili furniture, colourful fabrics, ‘Tingatinga’ paintings, nautical maps, old photographs and African mementos – and the result is a house with great character and personality. 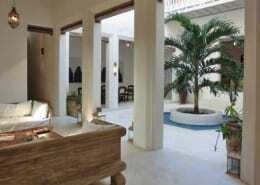 The expansive Ground Floor of the house offers a huge and comfortable living-room, well supplied with relaxing ‘baraza’ sofa-beds, antique planter’s chairs and other traditional Lamu furniture. Also downstairs is a spacious library and bar area, large dining room and well-equipped kitchen and laundry. All the rooms lead out onto various patios and verandas and shady seating areas for a true indoor / outdoor living experience. Ras Firdsaws is surrounded by 1.5 acres of tropical gardens, full of flowering bushes and shrubs, fruit trees and colourful birdlife. Also in the garden to the rear of the main house is a separate 1-bedroom guest cottage. Together with the 6 bedrooms in the main house (all with ensuite bathrooms) this means that the property can comfortably accommodate up to 12 guests in total. Each bedroom has a private terrace, with views of the sea from the front of the house, and of the gardens, sand-dunes and palm trees from the rear. A seafront-facing terrace runs the entire length of the First Floor of the house, and the castellated rooftop is a spectacular area, ideal for sunset cocktails. There are also plenty of staff on hand at Ras Firdaws to meet your every need during your stay – including full-time house manager, housekeeper, experienced chef, gardener and night watchman. 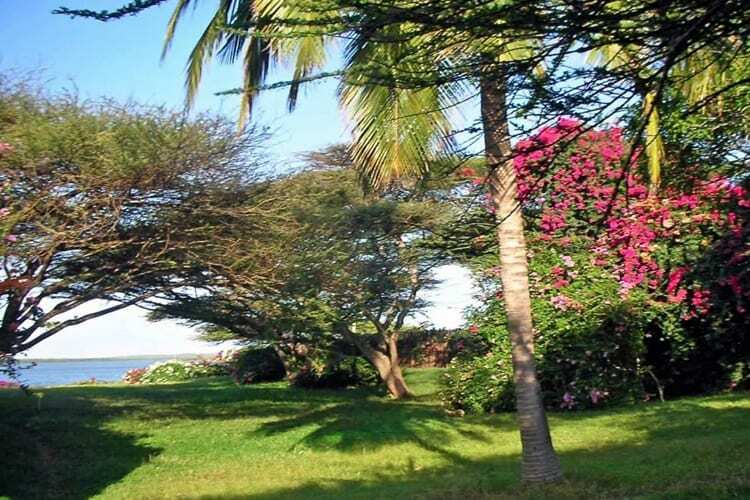 Ras Firdaws is a much admired and much photographed house – its beautiful setting, distinctive architecture and dramatic spreading acacia tree can’t help but draw the eye of every passing visitor. It sits in a lovely elevated spot just outside Shela – the village is about 500 metres away and an easy stroll along the seafront at low tide. At other times water taxis or dhows can moor directly beside the house’s seafront steps. 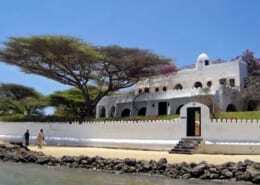 Lamu Town is approximately 2 kilometres north of Ras Firdaws and again is easily reached on foot or by boat. Ras Firdaws is the ideal Lamu retreat for guests looking for the best of both worlds – absolute comfort, space, peace and privacy on one hand – and quick and easy access to the many attractions of the islands on the other. Ras Firdaws is around 500 metres north of Shela Village and 900 metres from Peponi Hotel and the beach – an easy stroll along the seafront at low tide. At other times water taxis or dhows can moor directly beside the house’s seafront steps. 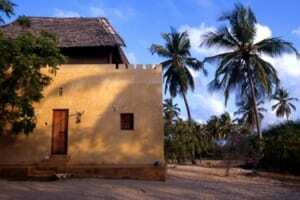 Lamu Town is approximately 2 kilometres north of Ras Firdaws and easily reached on foot or by boat. Manda Airport is approximately 3 kilometres away and just a few minutes by boat. We look forward to hearing all about your stay at Ras Firdaws.